Rcpp has become the most popular way of enhancing GNU R with C or C++ code. As of today, 1598 packages on CRAN depend on Rcpp for making analytical code go faster and further, along with 152 in BioConductor release 3.8. Per the (partial) logs of CRAN downloads, we currently average 921,000 downloads a month. This release feature a number of different pull requests detailed below. Subsetting is no longer limited by an integer range (William Nolan in #920 fixing #919). Error messages from subsetting are now more informative (Qiang and Dirk). Shelter increases count only on non-null objects (Dirk in #940 as suggested by Stepan Sindelar in #935). AttributeProxy::set() and a few related setters get Shield<> to ensure rchk is happy (Romain in #947 fixing #946). Fixed an issue where 'stale' symbols could become registered in RcppExports.cpp, leading to linker errors and other related issues (Kevin in #939 fixing #733 and #934). The wrapper macro gets an UNPROTECT to ensure rchk is happy (Romain in #949) fixing #948). Three small corrections were added in the 'Rcpp Quickref' vignette (Zhuoer Dong in #933 fixing #932). The Rcpp-modules vignette now has documentation for .factory (Ralf Stubner in #938 fixing #937). Travis CI again reports to CodeCov.io (Dirk and Ralf Stubner in #942 fixing #941). A new RcppArmadillo bugfix release arrived at CRAN today. The version 0.9.200.7.0 is another minor bugfix release, and based on the new Armadillo bugfix release 9.200.7 from earlier this week. I also just uploaded the Debian version, and Uwe’s systems have already create the CRAN Windows binary. This release just brings minor upstream bug fixes, see below for details (and we also include the updated entry for the November bugfix release). A maintenance release of RcppStreams arrived on CRAN this afternoon. RcppStreams brings the excellent Streamulus C++ template library for event stream processing to R.
This release provides a minor update, motivated by the upcoming BH release 1.69 for which we made a pre-release – and RcppStreams is one of three packages identified by that pre-release as needed minor accomodations for the new Boost release. We also updated packaging to current CRAN standards, but made no other changes. 1000 packages in April 2017, and 1250 packages in November 2018. The chart extends to the very beginning via manually compiled data from CRANberries and checked with crandb. The next part uses manually saved entries. The core (and by far largest) part of the data set was generated semi-automatically via a short script appending updates to a small file-based backend. A list of packages using Rcpp is kept on this page. Also displayed in the graph is the relative proportion of CRAN packages using Rcpp. The four per-cent hurdle was cleared just before useR! 2014 where I showed a similar graph (as two distinct graphs) in my invited talk. We passed five percent in December of 2014, six percent July of 2015, seven percent just before Christmas 2015, eight percent last summer, nine percent mid-December 2016, cracked ten percent in the summer of 2017 and eleven percent this year. We are currently at 11.199 percent or just over one in nine packages. There is more detail in the chart: how CRAN seems to be pushing back more and removing more aggressively (which my CRANberries tracks but not in as much detail as it could), how the growth of Rcpp seems to be slowing somewhat outright and even more so as a proportion of CRAN – just like every growth curve should, eventually. But we leave all that for another time. 1500 user packages is pretty mind-boggling. We can use the progression of CRAN itself compiled by Henrik in a series of posts and emails to the main development mailing list. 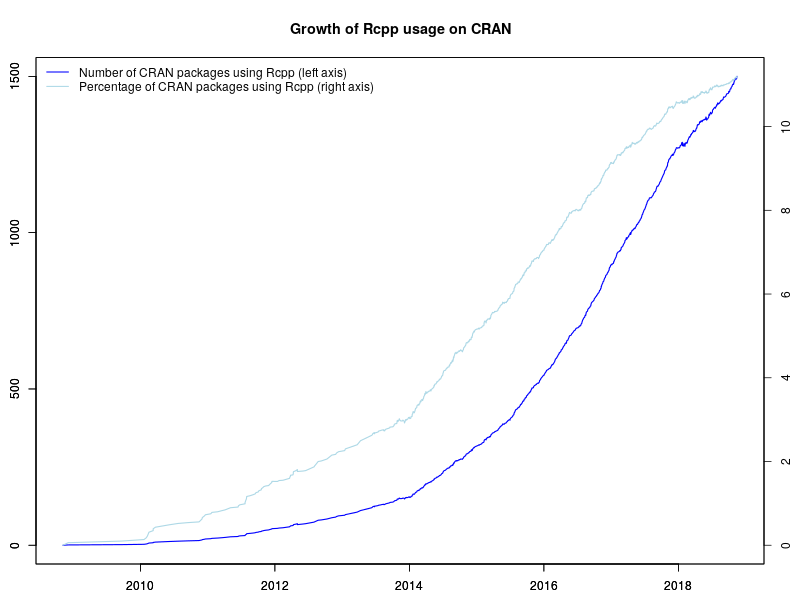 Not that long ago CRAN itself did not have 1500 packages, and here we are at almost 13400 with Rcpp at 11.2% and still growing (albeit slightly more slowly). Amazeballs. This puts a whole lot of responsibility on us in the Rcpp team as we continue to keep Rcpp as performant and reliable as it has been. And with that, and as always, a very big Thank You! to all users and contributors of Rcpp for help, suggestions, bug reports, documentation or, of course, code. An unused main() in src/time_tool.cc was #ifdef'ed away to please another compiler/OS combination. Dockerfiles for continuous integration, standard deployment and 'plus sized' deployment are provided along with builds (Dirk in #894). A new version of RcppAPT – our interface from R to the C++ library behind the awesome apt, apt-get, apt-cache, … commands and their cache powering Debian, Ubuntu and the like – is now on CRAN. This version is a bit of experiment. I had asked on the r-package-devel and r-devel list how I could suppress builds on macOS. As it does not have the required libapt-pkg-dev library to support the apt, builds always failed. CRAN managed to not try on Solaris or Fedora, but somewhat macOS would fail. Each. And. Every. Time. Sadly, nobody proposed a working solution. So I got tired of this. Now we detect where we build, and if we can infer that it is not a Debian or Ubuntu (or derived system) and no libapt-pkg-dev is found, we no longer fail. Rather, we just set a #define and at compile-time switch to essentially empty code. Et voilà: no more build errors. And as before, if you want to use the package to query the system packaging information, build it on system using apt and with its libapt-pkg-dev installed. A few other cleanups were made too. A bit more information about the package is available here as well as as the GitHub repo. It once again follows our (and Conrad's) bi-monthly release schedule. Conrad started with a new 9.100. * series a few days ago. I ran reverse-depends checks and found an issue which he promptly addressed; CRAN found another which he also very promptly addressed. It remains a true pleasure to work with such experienced professionals as Conrad (with whom I finally had a beer around the recent useR! in his home town) and of course the CRAN team whose superb package repository truly is the bedrock of the R community. Armadillo is a powerful and expressive C++ template library for linear algebra aiming towards a good balance between speed and ease of use with a syntax deliberately close to a Matlab. RcppArmadillo integrates this library with the R environment and language--and is widely used by (currently) 479 other packages on CRAN. Another small maintenance release of the RcppCNPy package arrived on CRAN a few minutes ago. I updated and refreshed the vignettes, and also mention the reticulate-based alternative, and its still new-ish vignette, in the README.md. The vignettes have been updated using ‘collapse’ mode and edited. 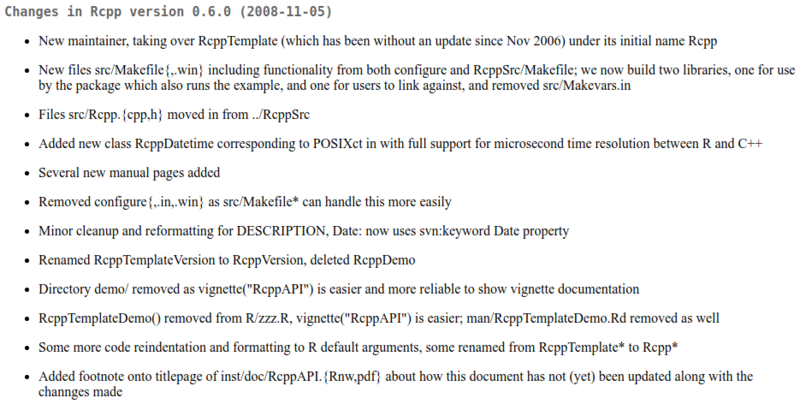 The README.md now refers to reticulate as an alternative and points to the “Using reticulate” vignette. The file src/RcppExports.cpp is used for package registration instead of src/init.c. Another bi-monthly update in the 0.12. * series of Rcpp landed on CRAN early this morning following less than two weekend in the incoming/ directory of CRAN. As always, thanks to CRAN for all the work they do so well. So once more, this release follows the 0.12.0 release from July 2016, the 0.12.1 release in September 2016, the 0.12.2 release in November 2016, the 0.12.3 release in January 2017, the 0.12.4 release in March 2016, the 0.12.5 release in May 2016, the 0.12.6 release in July 2016, the 0.12.7 release in September 2016, the 0.12.8 release in November 2016, the 0.12.9 release in January 2017, the 0.12.10.release in March 2017, the 0.12.11.release in May 2017, the 0.12.12 release in July 2017, the 0.12.13.release in late September 2017, the 0.12.14.release in November 2017, the 0.12.15.release in January 2018, the 0.12.16.release in March 2018, and the 0.12.17 release in May 2018 making it the twenty-second release at the steady and predictable bi-montly release frequency (which started with the 0.11. * series). Rcpp has become the most popular way of enhancing GNU R with C or C++ code. As of today, 1403 packages on CRAN depend on Rcpp for making analytical code go faster and further, along with another 138 in the current BioConductor release 3.7. A pretty decent number of changes, contributed by a number of Rcpp core team members as well as Rcpp user, went into this. Full details are below. The StringProxy::operator== is now const correct (Romain in #855 fixing #854). The Environment::new_child() is now const (Romain in #858 fixing #854). Next eval codes now properly unwind (Lionel in the large and careful #859 fixing #807). In debugging mode, more type information is shown on abort() (Jack Wasey in #860 and #882 fixing #857). A new class was added which allow suspension of the RNG synchronisation to address an issue seen in RcppDE (Kevin in #862). Evaluation calls now happen in the base environment (which may fix an issue seen between conflicted and some BioConductor packages) (Kevin in #863 fixing #861). Call stack display on error can now be controlled more finely (Romain in #868). The new Rcpp_fast_eval is used instead of Rcpp_eval though this still requires setting RCPP_USE_UNWIND_PROTECT before including Rcpp.h (Qiang Kou in #867 closing #866). The Rcpp::unwindProtect() function extracts the unwinding from the Rcpp_fast_eval() function and makes it more generally available. (Lionel in #873 and #877). The tm_gmtoff part is skipped on AIX too (#876). The sourceCpp() function now evaluates R code in the correct local environment in which a function was compiled (Filip Schouwenaars in #852 and #869 fixing #851). Filenames are now sorted in a case-insenstive way so that the RcppExports files are more stable across locales (Jack Wasey in #878). The sugar functions min and max now recognise empty vectors (Dirk in #884 fixing #883). Thanks to CRANberries, you can also look at a diff to the previous release. As always, details are on the Rcpp Changelog page and the Rcpp page which also leads to the downloads page, the browseable doxygen docs and zip files of doxygen output for the standard formats. Questions, comments etc should go to the rcpp-devel mailing list off the R-Forge page. A new maintenance release, now at version 0.9.11, of the RcppClassic package arrived earlier today on CRAN. This package provides a maintained version of the otherwise deprecated initial Rcpp API which no new projects should use as the normal Rcpp API is so much better. Per another request from CRAN, we updated the source code in four places to no longer use dynamic exceptions specification. This is something C++11 deprecated, and g++-7 and above now complain about each use. No other changes were made. CRANberries also reports the changes relative to the previous release. 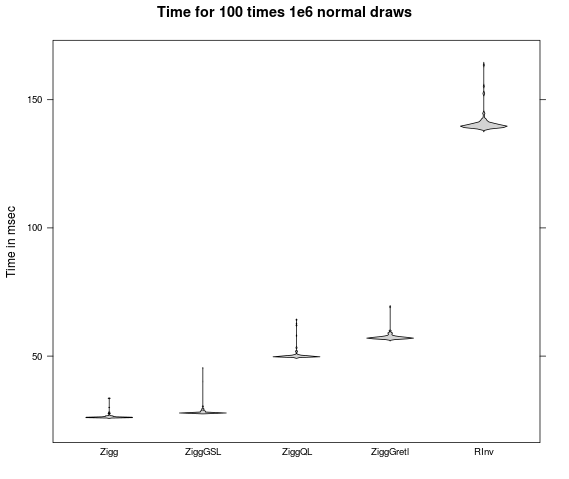 The RcppZiggurat package updates the code for the Ziggurat generator which provides very fast draws from a Normal distribution. The package provides a simple C++ wrapper class for the generator improving on the very basic macros, and permits comparison among several existing Ziggurat implementations. This can be seen in the figure where Ziggurat from this package dominates accessing the implementations from the GSL, QuantLib and Gretl—all of which are still way faster than the default Normal generator in R (which is of course of higher code complexity). Per a request from CRAN, we changed the vignette to accomodate pandoc 2. * just as we did with the most recent pinp release two days ago. No other changes were made. Other changes that have been pending are a minor rewrite of DOIs in DESCRIPTION, a corrected state setter thanks to a PR by Ralf Stubner, and a tweak for function registration to have user_norm_rand() visible. The NEWS file entry below lists all changes. Description rewritten using doi for references. Dynamic registration reverts to manual mode so that user_norm_rand() is visible as well (#7). The vignette was updated to accomodate pandoc 2* [CRAN request]. Courtesy of CRANberries, there is also a diffstat report for the most recent release. More information is on the RcppZiggurat page. Per a request from CRAN, we changed the vignette to accomodate pandoc 2. * just as we did with the most recent pinp release two days ago. No other changes were made. RcppDE is a "port" of DEoptim, a popular package for derivative-free optimisation using differential evolution optimization, to C++. By using RcppArmadillo, the code becomes a lot shorter and more legible. Our other main contribution is to leverage some of the excellence we get for free from using Rcpp, in particular the ability to optimise user-supplied compiled objective functions which can make things a lot faster than repeatedly evaluating interpreted objective functions as DEoptim (and, in fairness, just like most other optimisers) does. That is also what lead to this upload: Kyle Baron noticed an issue when nesting a user-supplied compiled function inside a user-supplied compiled objective function -- and when using the newest Rcpp. This has to do with some cleanups we made for how RNG state is, or is not, set and preserved. Kevin Ushey was (once again) a real trooper here and added a simple class to Rcpp (in what is now the development version 0.12.17.2 available on the Rcpp drat repo) and used that here to (selectively) restore behaviour similarly to what we had in Rcpp (but which created another issue for another project). So all that is good now in all use cases. We also have some other changes contributed by Yi Kang some time ago for both JADE style randomization and some internal tweaks. Some packaging details were updated, and that sums up release 0.1.6. Another bi-monthly update and the seventeenth release in the 0.12. * series of Rcpp landed on CRAN late on Friday following nine (!!) days in gestation in the incoming/ directory of CRAN. And no complaints: we just wish CRAN were a little more forthcoming with what is happenening when, and/or would let us help supplying additional test information. I do run a fairly insane amount of backtests prior to releases, only to then have to wait another week or more is ... not ideal. But again, we all owe CRAN and immense amount of gratitude for all they do, and do so well. So once more, this release follows the 0.12.0 release from July 2016, the 0.12.1 release in September 2016, the 0.12.2 release in November 2016, the 0.12.3 release in January 2017, the 0.12.4 release in March 2016, the 0.12.5 release in May 2016, the 0.12.6 release in July 2016, the 0.12.7 release in September 2016, the 0.12.8 release in November 2016, the 0.12.9 release in January 2017, the 0.12.10.release in March 2017, the 0.12.11.release in May 2017, the 0.12.12 release in July 2017, the 0.12.13.release in late September 2017, the 0.12.14.release in November 2017, the 0.12.15.release in January 2018 and the 0.12.16.release in March 2018 making it the twenty-first release at the steady and predictable bi-montly release frequency. Rcpp has become the most popular way of enhancing GNU R with C or C++ code. As of today, 1362 packages on CRAN depend on Rcpp for making analytical code go faster and further, along with another 138 in the current BioConductor release 3.7. Compared to other releases, this release contains again a relatively small change set, but between Kevin and Romain cleaned a few things up. Full details are below. The random number Generator class no longer inhreits from RNGScope (Kevin in #837 fixing #836). The optional Timer class header now undefines FALSE which was seen to have side-effects on some platforms (Romain in #847 fixing #846). Optional StoragePolicy attributes now also work for string vectors (Romain in #850 fixing #849). A minor update version 0.3.4 of RcppGSL is now on CRAN. It contains an improved Windows build system (thanks, Jeroen!) and updates the C++ headers by removing dynamic exception specifications which C++11 frowns upon, and the compilers lets us know that in no uncertain terms. Builds using RcppGSL will now be more quiet. And as always, an extra treat for Solaris. Windows builds were updated (Jeroen Ooms in #16). Remove dynamic exception specifications which are deprecated with C++11 or later (Dirk in #17). Accomodate Solaris by being more explicit about sqrt. Am maintenance release of RcppMsgPack got onto CRAN this afternoon. It contains a single static_cast fix to address a warning which g++-8.1 shows whereas older compilers remained silent---and CRAN asked us to address this. Apply a static_cast from upstream to suppress a warning from g++-8.1 as requested by CRAN. RcppArmadillo release 0.8.500.0, originally prepared and uploaded on April 21, has hit CRAN today (after having already been available via the RcppCore drat repo). A corresponding Debian release will be prepared as well. This RcppArmadillo release contains Armadillo release 8.500.0 with a number of rather nice changes (see below for details), and continues our normal bi-monthly CRAN release cycle. Armadillo is a powerful and expressive C++ template library for linear algebra aiming towards a good balance between speed and ease of use with a syntax deliberately close to a Matlab. RcppArmadillo integrates this library with the R environment and language--and is widely used by (currently) 472 other packages on CRAN. Fewer LAPACK compile-time guards are used, new unit tests for underlying features have been added (Keith O'Hara in #211 addressing #207). The configure check for LAPACK features has been updated accordingly (Keith O'Hara in #214 addressing #213). The compile-time check for g++ is now more robust to minimal shell versions (#217 addressing #216). Compiler tests to were added for macOS (Keith O'Hara in #219). Another minor maintenance release of the RcppCNPy package arrived on CRAN this evening. There is only small code change: a path is now checked before an attempt to save. Thanks to Wush for the suggestion. I also added a short new vignette showing how reticulate can be used for NumPy data. The npySave function has a new option to check the path in the given filename. A new vignette was added showing how the reticulate package can be used instead. A new release, now at 0.2.1, of the RcppSMC package arrived on CRAN earlier this afternoon (and once again as a very quick pretest-publish within minutes of submission). RcppSMC provides Rcpp-based bindings to R for the Sequential Monte Carlo Template Classes (SMCTC) by Adam Johansen described in his JSS article. Sequential Monte Carlo is also referred to as Particle Filter in some contexts . This releases contains a few bug fixes and one minor rearrangment allowing header-only use of the package from other packages, or via a Rcpp plugin. Many of these changes were driven by new contributors, which is a wonderful thing to see for any open source project! So thanks to everybody who helped with. Full details below. The sampler now has a copy constructor and assignment overload (Brian Ni in #28). The SMC library component can now be used in header-only mode (Martin Lysy in #29). Plugin support was added for use via cppFunction() and other Rcpp Attributes (or inline functions (Dirk in #30). The sampler copy ctor/assigment operator is now copy-constructor safe (Martin Lysy In #32). A bug in state variance calculation was corrected (Adam in #36 addressing #34). History getter methods are now more user-friendly (Tiberiu Lepadatu in #37). Use of pow with atomic types was disambiguated to std::pow) to help the Solaris compiler (Dirk in #42). More information is on the RcppSMC page. Issues and bugreports should go to the GitHub issue tracker. Per a CRAN email sent to 300+ maintainers, this package (just like many others) was asked to please register its S3 method. So we did, and also overhauled a few other packagaging standards which changed since the previous uploads in December of 2012 (!!). No new code or features. Full details below. And as a reminder, don't use the old RcppClassic -- use Rcpp instead. Thanks to CRANberries, you can also look at a diff to the previous release. The sixteenth update the 0.12. * series of Rcpp landed on CRAN earlier this evening after a few days of gestation in incoming/ at CRAN. Once again, this release follows the 0.12.0 release from July 2016, the 0.12.1 release in September 2016, the 0.12.2 release in November 2016, the 0.12.3 release in January 2017, the 0.12.4 release in March 2016, the 0.12.5 release in May 2016, the 0.12.6 release in July 2016, the 0.12.7 release in September 2016, the 0.12.8 release in November 2016, the 0.12.9 release in January 2017, the 0.12.10.release in March 2017, the 0.12.11.release in May 2017, the 0.12.12 release in July 2017, the 0.12.13.release in late September 2017, the 0.12.14.release in November 2017, and the 0.12.15.release in January 2018 making it the twentieth release at the steady and predictable bi-montly release frequency. Rcpp has become the most popular way of enhancing GNU R with C or C++ code. As of today, 1316 packages on CRAN depend on Rcpp for making analytical code go faster and further, along with another 91 in BioConductor. Compared to other releases, this release contains a relatively small change set, but between Kirill, Kevin and myself a few things got cleaned up and solidified. Full details are below. Rcpp now sets and puts the RNG state upon each entry to an Rcpp function, ensuring that nested invocations of Rcpp functions manage the RNG state as expected (Kevin in #825 addressing #823). The R::pythag wrapper has been commented out; the underlying function has been gone from R since 2.14.0, and ::hypot() (part of C99) is now used unconditionally for complex numbers (Dirk in #826). The long long type can now be used on 64-bit Windows (Kevin in #811 and again in #829 addressing #804). Code generated with cppFunction() now uses .Call() directly (Kirill Mueller in #813 addressing #795). The Rcpp FAQ vignette is now indexed as 'Rcpp-FAQ'; a stale Gmane reference was removed and entry for getting compilers under Conda was added. The top-level README.md now has a Support section. The Rcpp.bib reference file was refreshed to current versions. 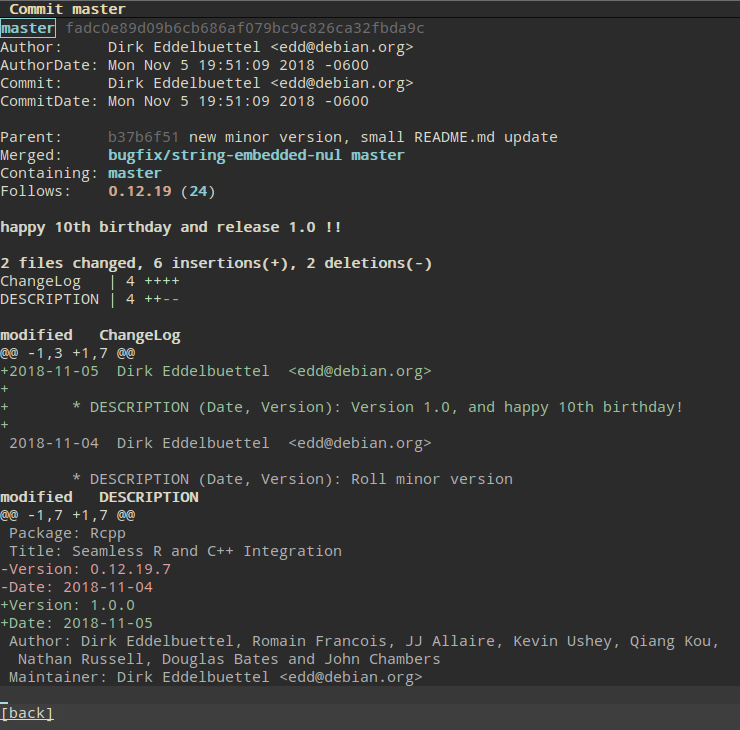 RcppArmadillo release 0.8.400.0.0, originally prepared and uploaded on February 19, finally hit CRAN today (after having been available via the RcppCore drat repo for a number of days). A corresponding Debian release was prepared and uploaded as well. This RcppArmadillo release contains Armadillo release 8.400.0 with a number of nice changes (see below for details), and continues our normal bi-monthly CRAN release cycle (slight delayes in CRAN processing notwithstanding). Armadillo is a powerful and expressive C++ template library for linear algebra aiming towards a good balance between speed and ease of use with a syntax deliberately close to a Matlab. RcppArmadillo integrates this library with the R environment and language--and is widely used by (currently) 450 other packages on CRAN. The configure generated header settings for LAPACK and OpenMP can be overridden by the user. This release was preceded by two release candidates which were tested extensively. This release contains a pretty large number of pull requests by a wide variety of authors. Most of these pull requests are very focused on a particular issue at hand. One was larger and ambitious with some forward-looking code for R 3.5.0; however this backfired a little on Windows and is currently "parked" behind a #define. Full details are below. Calls from exception handling to Rf_warning() now correctly set an initial format string (Dirk in #777 fixing #776). The 'new' Date and Datetime vectors now have is_na methods too. (Dirk in #783 fixing #781). Protect more temporary SEXP objects produced by wrap (Kevin in #784). Use public R APIs for new_env (Kevin in #785). Overly-clever checks for NA have been removed (Kevin in #790). The included tinyformat has been updated to the current version, Rcpp-specific changes are now more isolated (Kirill in #791). Overly picky fall-through warnings by gcc-7 regarding switch statements are now pre-empted (Kirill in #792). Permit compilation on ANDROID (Kenny Bell in #796). Improve support for NVCC, the CUDA compiler (Iñaki Ucar in #798 addressing #797). Speed up tests for NA and NaN (Kirill and Dirk in #799 and #800). Rearrange stack unwind test code, keep test disabled for now (Lionel in #801). Further condition away protect unwind behind #define (Dirk in #802). Addressed a missing Rcpp namespace prefix when generating a C++ interface (James Balamuta in #779). The Rcpp FAQ now shows Rcpp::Rcpp.plugin.maker() and not the outdated ::: use applicable non-exported functions. Some corrections and update to DESCRIPTION, README.md, msgpack.org.md and vignette (#6). Update to c_pack.cpp and tests (#7). More efficient packing of vectors (#8). Support for timestamps and NAs (#9). Conditional use of microbenchmark in tests/ as required for Suggests: package [CRAN request] (#10). Minor polish to tests relaxing comparison of timestamp, and avoiding a few g++ warnings (#12 addressing #11). A minor maintenance release of the RcppCNPy package arrived on CRAN this week. There is no code change here. But to process the vignette we rely on knitr which sees Python here and (as of its most recent release) wants the (excellent !!) reticulate package. Which is of course overkill just to process a short pdf document, so we turned this off. Armadillo is a powerful and expressive C++ template library for linear algebra aiming towards a good balance between speed and ease of use with a syntax deliberately close to a Matlab. RcppArmadillo integrates this library with the R environment and language--and is widely used by (currently) 405 other packages on CRAN. Earlier today Rcpp passed 1250 reverse-dependencies on CRAN as another big milestone. The graph is on the left depicts the growth of Rcpp usage (as measured by Depends, Imports and LinkingTo, but excluding Suggests) over time. Rcpp cleared 300 packages in November 2014. It passed 400 packages in June 2015 (when I only tweeted about it), 500 packages in late October 2015, 600 packages last March, 700 packages last July, 800 packages last October, 900 packages early January, and 1000 packages in April. The chart extends to the very beginning via manually compiled data from CRANberries and checked with crandb. The next part uses manually saved entries. The core (and by far largest) part of the data set was generated semi-automatically via a short script appending updates to a small file-based backend. A list of packages using Rcpp is kept on this page. Also displayed in the graph is the relative proportion of CRAN packages using Rcpp. The four per-cent hurdle was cleared just before useR! 2014 where I showed a similar graph (as two distinct graphs) in my invited talk. We passed five percent in December of 2014, six percent July of 2015, seven percent just before Christmas 2015, eight percent last summer, nine percent mid-December 2016 and then cracked ten percent this summer. 1250 user packages is staggering. We can use the progression of CRAN itself compiled by Henrik in a series of posts and emails to the main development mailing list. 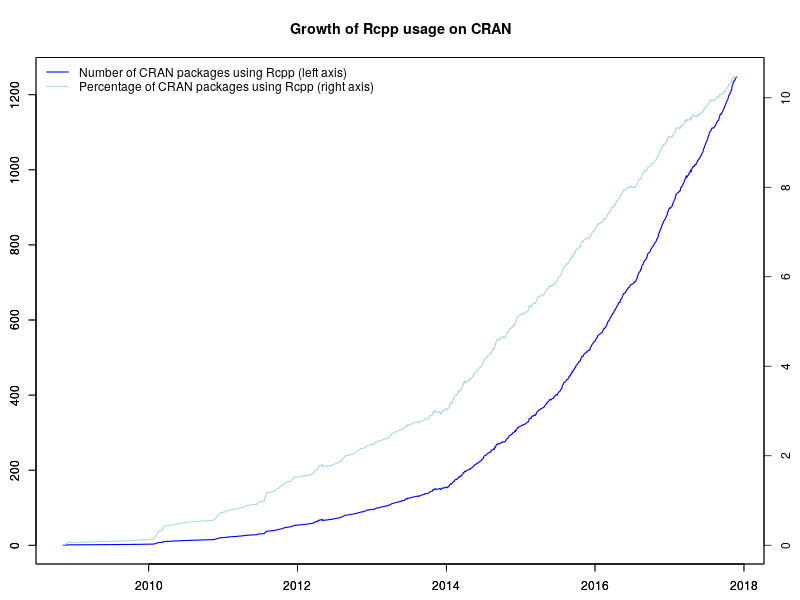 A decade ago CRAN itself did not have 1250 packages, and here we are approaching 12k with Rcpp at 10% and growing steadily. Amazeballs. The fourteenth release in the 0.12. * series of Rcpp landed on CRAN yesterday after a somewhat longer-than-usual gestation period (and word is it may have been due to some unrelated disturbances from lots of changes within the main r-devel build). This release follows the 0.12.0 release from July 2016, the 0.12.1 release in September 2016, the 0.12.2 release in November 2016, the 0.12.3 release in January 2017, the 0.12.4 release in March 2016, the 0.12.5 release in May 2016, the 0.12.6 release in July 2016, the 0.12.7 release in September 2016, the 0.12.8 release in November 2016, the 0.12.9 release in January 2017, the 0.12.10.release in March 2017, the 0.12.11.release in May 2017, the 0.12.12 release in July 2017 and the 0.12.13.release in late September 2017 making it the eighteenth release at the steady and predictable bi-montly release frequency. Rcpp has become the most popular way of enhancing GNU R with C or C++ code. As of today, 1246 packages (and hence 77 more since the last release) on CRAN depend on Rcpp for making analytical code go faster and further, along with another 91 in BioConductor. This release is relatively minor compared to other releases, but follows through on the deprecattion of the old vectors for Date and Datetime (which were terrible: I was influenced by the vector design in QuantLib at the time and didn't really understand yet how a SEXP vector should work) we announced with Rcpp 0.12.8 a year ago. So now the new vectors are the default, but you can flip back if you need to with #define. Otherwise Dan rounded a corner with the improved iterators he contributed, and Kirill improved the output stream implementation suppressing a warning with newer compilers. New const iterators functions cbegin() and cend() added to MatrixRow as well (Dan Dillon in #750). The Rostream object now contains a Buffer rather than allocating one (Kirill Müller in #763). New DateVector and DatetimeVector classes are now the default fully deprecating the old classes as announced one year ago. DESCRIPTION file now list doi information per CRAN suggestion. Update CITATION file with doi information and PeerJ preprint. Thanks to CRANberries, you can also look at a diff to the previous release. As always, details are on the Rcpp Changelog page and the Rcpp page which also leads to the downloads page, the browseable doxygen docs and zip files of doxygen output for the standard formats. A local directory has source and documentation too. Questions, comments etc should go to the rcpp-devel mailing list off the R-Forge page. A maintenance release 0.3.3.3.1 of RcppEigen is now on CRAN (and will get to Debian soon). It brings Eigen 3.3. * to R.
The impetus was a request from CRAN to change the call to Rcpp::Rcpp.plugin.maker() to only use :: as the function has in fact been exported and accessible for a pretty long time. So now the usage pattern catches up. Otherwise, Haiku-OS is now supported and a minor Travis tweak was made. Compilation under Haiku-OS is now supported (Yu Gong in #45). The Rcpp.plugin.maker helper function is called via :: as it is in fact exported (yet we had old code using :::). A spurious argument was removed from an example call. Travis CI now uses https to fetch the test runner script. Per a request from CRAN, we changed the call to Rcpp::Rcpp.plugin.maker() to only use :: as the function has in fact been exported and accessible for a pretty long time. So now the usage pattern catches up. A first maintenance release of RcppQuantuccia got to CRAN earlier today. RcppQuantuccia brings the Quantuccia header-only subset / variant of QuantLib to R. At present it mostly offers calendaring, but Quantuccia just got a decent amount of new functions so hopefully we can offer more here too. This release was motivated by the upcoming Rcpp release which will deprecate the okd Date and Datetime vectors in favours of newer ones. So this release of RcppQuantuccia switches to the newer ones. Added calendars for Canada, China, Germany, Japan and United Kingdom. Added bespoke and joint calendars. Using new date(time) vectors (#6). Courtesy of CRANberries, there is also a diffstat report relative to the previous release. More information is on the RcppQuantuccia page. Issues and bugreports should go to the GitHub issue tracker. We are thrilled to announce a new big RcppArmadillo release! Conrad recently moved Armadillo to the 8. * series, with significant improvements and speed ups for sparse matrix operations, and more. See below for a brief summary. This also required some changes at our end which Binxiang Ni provided, and Serguei Sokol improved some instantiations. We now show the new vignette Binxiang Ni wrote for his GSoC contribution, and I converted it (and the other main vignette) to using the pinp package for sleeker pdf vignettes. This release resumes our bi-monthly CRAN release cycle. I may make interim updates available at GitHub "as needed". And this time I managed to mess up the reverse depends testing, and missed one sync() call on the way back to R---but all that is now taken care of. A maintenance release of RcppZiggurat is now on the CRAN network for R. It switched the vignette to the our new pinp package and its two-column pdf default. The RcppZiggurat package updates the code for the Ziggurat generator which provides very fast draws from a Normal distribution. The package provides a simple C++ wrapper class for the generator improving on the very basic macros, and permits comparison among several existing Ziggurat implementations. This can be seen in the figure where Ziggurat from this package dominates accessing the implementations from the GSL, QuantLib and Gretl---all of which are still way faster than the default Normal generator in R (which is of course of higher code complexity). Dynamic symbol registration is now enabled. A few short weeks after the more substantial 0.0.9 release of RcppAnnoy, we have a quick bug-fix update. RcppAnnoy is our Rcpp-based R integration of the nifty Annoy library by Erik. Annoy is a small and lightweight C++ template header library for very fast approximate nearest neighbours. Michaël Benesty noticed that our getItemsVector() function didn't, ahem, do much besides crashing. Simple bug, they happen--now fixed, and a unit test added. Once again no changes in user-facing code. But this makes it the first package to use the very new and shiny pinp package as the backend for its vignette, now converted to Markdown---see here for this new version. We also updated three sources files for tabs versus spaces as the current g++ version complained (correctly !!) about misleading indents. Otherwise a file src/init.c was added for dynamic registration, the Travis CI runner script was updated to using run.sh from our r-travis fork, and we now strip the library after they have been built. Again, no user code changes. And no iterate: nobody should use this package. Rcpp is so much better in so many ways---this one is simply available as we (quite strongly) believe that APIs are contracts, and as such we hold up our end of the deal.